One of my biggest passions is Football especially Manchester City Football Club. I think this all began because my mother worked on a Saturday in my early years and my father used to take me to football with him, I reckon I must have been around 4 when I first went. I was taken around the local clubs of Manchester – Bury, Rochdale, Oldham and Bolton. I chose Manchester City because my older brother was crazy about them. Being in a football crowd and stadium became second nature to me. I’m one of those supporters who remember Wagon Wheels as being huge – needing 2 hands to hold it and eat it. I’ve never been able to ascertain whether they really have shrunk in size or my hands got bigger. At school I palled up with another girl who loved football and as soon as we left school at 16 we followed our team home and away. This was 1976 and we were around through the nasty years of football violence. Thankfully something that is seen very little. My husband enjoys football but in his words he is ‘not tribal’ he describes himself as a Sky fan – preferring to watch from the comfort of his couch. Where as I like to be inside a stadium enjoying the excitement of a live game – the sights, smells – pies at half time eminating up through the stand, and the banter and songs between rival fans. There is nothing to beat the humour in a football crowd. being a City fan that has been the thing that got us through the dark days of the old Second Division – that graveyard humour was the most exciting thing we experienced. I can watch wall to wall football – any team and any league. I know the advent of Sky TV coverage is much maligned in some quarters – dictating game times particularly, but being an addict I love that I can get my ‘fix’ most days. I really admire women in football, whatever their roles – Karren Brady, Helen Chamberlain, Bianca Westwood and Dr Eva Carneiro to name 4 and I admire the new found love for Women’s football particularly after our Lionesses fabulous efforts in the recent World Cup – put our men to shame. 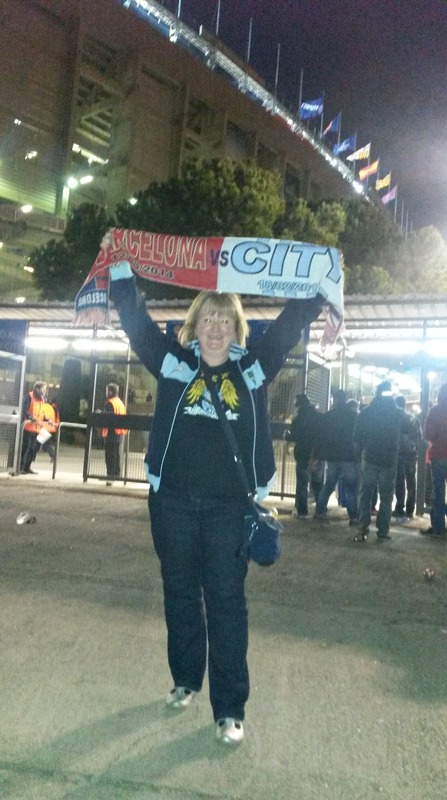 For women who bemoan their husbands obsession with football – my message is if you can’t beat them join them! You never know you may like it. One of my friends who has never been a football fan has been taken to games at FC United of Manchester and is now addicted and she’s 66!